With the advent of portable devices like smartphones, tablets and rugged devices, software & application updates, security patches were difficult to handle.IT leaders needed a single point solution wherein they can manage and control the services provisioned tothese portable devices effectively, thanks to device management technologies. 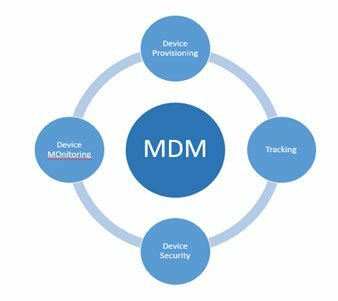 MDM is a device centric approach wherein the focus is more on device management than services.Its focuses on securing corporate data, emails, documents IT can manage,track and secure any device remotelybe it employee-owned or corporate-owned. Employees expect minimal control of their devices from employers while provisioning corporate services. By creating device profiles, IT can enable a device to do a specific task in a controlled environment, without compromising corporate policies. From IT perspective, features like Bulk provisioning, enrollment, tracking, and monitoring on a single interface, are powerful tools.Dashboards have added a completely new perspective to view reports. You can fetch any report and get all the data in a matter of seconds. Just in case a device is lost or stolen, IT can remotely lock, wipe the entire device with a single click. 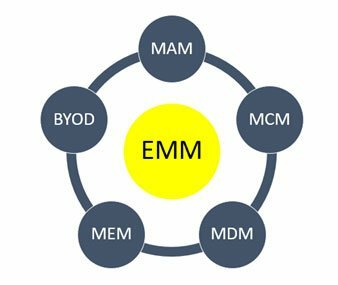 Over the years, MDM has evolved into EMM (Enterprise Mobility Management), UEM (Unified Endpoint Management). Enterprise Mobility is a group of people, processes and technology managing mobile devices, and mobile computing services.Enterprise Mobility Management is a step ahead of MDM. It’s an amalgamation of MDM, MAM (Mobile Application Management), MCM (Mobile Content Management), and MEM (Mobile Email Management). It enables device, application, content, and email management along with application wrapping, tunneling, encryption and containerization. All in a single suite. Suppose a user wants to access an internal website on his smartphone from a remote location. He just needs to enter the website URL, rest all will be handled by the device agent which communicates with your corporate network. IT, can now restrict copy-paste, screenshots, attachments & document sharing on the device with non-approved apps.Patches, updates can be delivered to devices over-the-air without much user intervention using patch management. Also, if an employee leaves the organization, admin can delete the enterprise settings without physically handling the device.At the same time, the personal data is untouched and unharmed. EMM makes defining and applying enterprise, security and regulatory compliance policies across devices easier and shifts the focus from device to application and content. 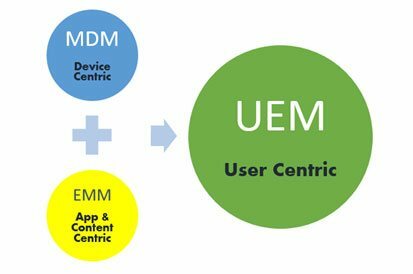 Gartner describes UEM as an expansion of enterprise mobility management (EMM). It can manage any endpoint (including desktop, laptop, smartphone, tablets, printers, and rugged), OS (windows, android, iOS, macOS, chromeOS), IOT, wearable’s, any application and any business use case with greater efficiency and reduced costs. So what makes UEM more efficient? Artificial Intelligence, Identity Management, and Business Intelligence, Endpoint management, Lifecycle management. Leveraging data from devices, user & device behavior patterns, and usage statistics. UEM provides users with a single interface wherein they can access multiple resources, thus User-centric. Suppose Warehouse Management team wants to streamline and speed up the task of loading and unloading material. UEM can help achieve this by containerizing the device and creating a profile with access to camera and barcode scanner and their applications that can communicate with servers. Job sheets can be printed directly from their Rugged or Smart devices. UEM enables complete lifecycle management from onboarding to retirement across all devices. IT can integrate systems like SCCM, Active Directory, SharePoint with UEM to make provisioning smoother. A single pane can do all the tasks earlier delegated to multiple towers. Handling, tracking and maintaining an inventory of all the assets including laptops, desktops, mobile devices and other IT peripherals becomes much smoother with asset management. Consider thousands of vending machines, ATMs, ticketing systems and other public & private systems reporting availability of the stocks, inventory and other data in real-time, monitored and managed centrally. UEM can understand such varied systems and machines without much intervention and can interpret the data in a logical and reasonable way. IOT devices, sensors and other wearable’stransmitting unusual data patterns, from unspecified locations can be tracked using SIEM (System Information and Event Management) integrated with UEM, and right compliance policies. Data captured from these different platforms, devices, IOT provides a rich insight into the functioning and health statistics. Business can receive real time data and make quick decisions to increase availability, reachability and reduce service down times. Organization should take decisions based on business use case whether to adopt MDM, EMM or UEM.It is important to understand the purpose of implementing any enterprise mobility solutions policy and how it can help reduce costs and improve employee productivity.